I found a pack of NBUS chipboard flowers in my stash so I treated one of them to a layer of gesso, a layer of white acrylic paint, then a layer of red acrylic with a touch of dark red around the centre and a good dollop of Stickles to the centre. I stamped the sentiment in Versafine Smoky Grey and Memento Rhubarb Stalk and splatted some Rhubarb Stalk on the card and drew a stalk before adhering the die-cut vase and flower. Beautiful! I love your colouring and shading, the splatter and the boldness of the focal point! Your DH must have been a rascal! I wonder what he would have said if your boys did that! Why am I not surprised that you married a "naughty boy?!" A stunning CAS card Shirley. Wow, looks like a winner to me! This is such a striking card! It just goes to show that a true artist can really pack a punch with a simple color palette! I love how you transformed the chipboard flower into that vibrant shade of red. It took a lot of effort, but was very worth it. It absolutely jumps off the page. The vase is perfect and the sentiment is so classy- I like the different fonts and colors in includes. Lastly, I love the little splatters of red. Whenever I try red splatters, it looks like I created a murder scene, so I really admire how well you treated your splatters! Thank you so much for sharing your talents with us here at the Simon Says Stamp Monday Challenge blog! 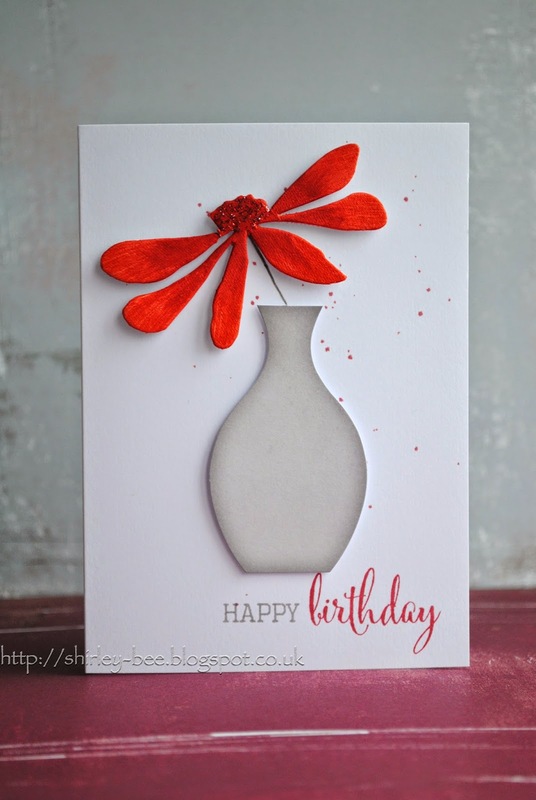 Absolutely beautiful card, totally love the red flower. So tell me Ican understand smashing the cabbages, I dont think there are many kids who like cabbages. But lumps of dirt at the clean sheets, did he have a death wish? Its awonder he lived to reach adult hood. this is absolutely gorgeous!!!! i love the simplicity AND the brightness of the flower! just gorgeous!!! GOR. GEE. US. That red just jumps off the page. As for DH, I think he needs a belated timeout. This just took my breath away. The whole card is so striking. Sounds like DH was quite the rascal! Your card truly is breathtaking! Stunning! Gorgeous! Elegant! Artistic! Creative! Love this, Shirley - such a stunning card. Great take on the inspiration card. The red flower really pops! I've really gotten behind on your blog...this is GORGEOUS, Shirley! I love how you added texture with the flowers...such a stunning color, too! Love your CAS vase as well...it's really perfect! GORGEOUS! Those flowers look real. Thank you so much for playing along in the Simon Says Happy Birthday Challenge over at the Simon Says Stamp Wednesday Challenge Blog this week! Very, very pretty. I love the red and gray. The flower is wonderful with the dimension from the chipboard. Congrats on your win over at CAS not surprised at all. Absolute perfection. Hi Shirley, This card is amazing :) How did you curl the chipboard? Thank you for all your time and creativity this is very nice! Another congrats on the win. I love this flower! This card is a masterpiece! Totally well deserved win, big congratulations!